This wonderful holiday home is located in the middle of some incredible natural landscapes. The owner, a true hiker and lover of walks in the Ardennes can give you more details about the possible biking and hiking paths starting in the outskirts of town. This pleasant holiday home with a living space of 120 m2 has a homely atmosphere throughout. You have a fire place in the living room where you can gather every night and have an aperitif and a bite to eat and go over your day. There is also an American kitchen with dining area, perfect for the culinary enthusiast. The children have their own play area. The fenced in private garden of 1000 m2 is just heavenly for young and old. The children can play unsupervised and use the playground equipment. The south facing terrace has a unique view over the surrounding nature. 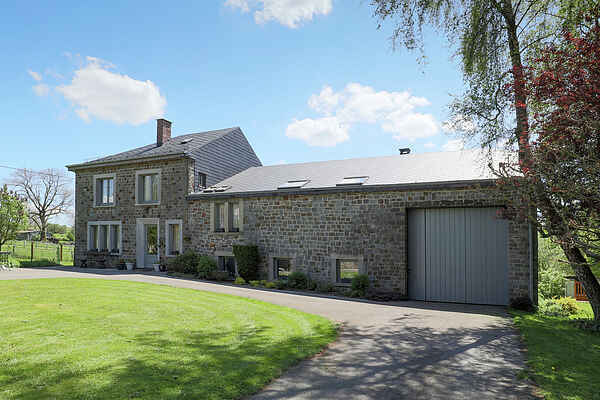 The holiday home is located in a small village, 10 kilometers from La Roche-en-Ardenne. The region of La Roche offers more than 200 kilometers of walking and biking routes and 20 kilometers of kayak tours. In the winter, walking paths become white cross country tracks or ski pistes. The first cross country tracks start 4 kilometers away in Champlon.